they are flossing and show up with heavy plaque, decay, and the dreaded gum disease with bone loss.. When we ask them to demonstrate proper flossing, they just take the floss and snap it between the teeth. Most are shocked to find out that just snapping floss between the teeth is not proper flossing. 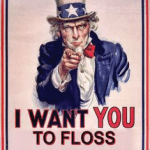 Floss is meant to be used near and underneath the gum line of each individual tooth. This is where plaque removal is most effective. 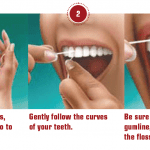 See how to do proper flossing below and next time you go in to your dentist for a cleaning, you can impress them with your knowledge of proper flossing! What was George Washington’s false teeth really made of?